What is not to love about beets? These colorful root veggies contain powerful nutrients that help protect against heart disease, birth defects & certain cancers. 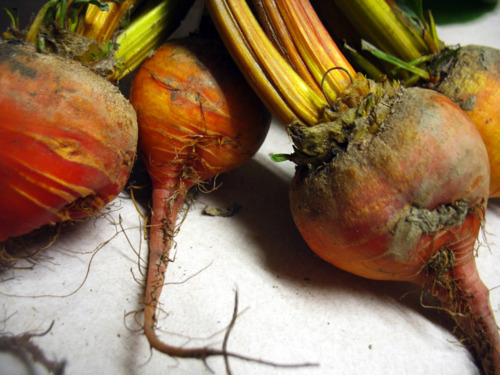 Beets are also rich in folate, antioxidants, & potassium. In addition, they’re are an excellent source of digestive-supportive dietary fiber, free radical scavenging vitamin C and copper, bone-healthy magnesium, & energy-producing iron & phosphorus. Let’s not forget about beet greens! Yes, you can eat them & you absolutely should! They are incredibly rich in nutrients, concentrated in vitamins, mineral & beta-carotene. Heat heavy large skillet over medium heat. Add walnuts & stir until lightly toasted, about 3 minutes. Transfer to small bowl. Add 1 Tbsp. oil & onions to same skillet & sauté until beginning to soften and turn golden, about 10 minutes. Reduce heat to medium-low & continue to sauté until onions are tender & browned, about 10-15 minutes more. Add garlic & stir 2 minutes. Scatter beet greens over onions. Drizzle remaining Tbsp. oil over; cover & cook until beet greens are tender, about 5 minutes. Meanwhile, cook whole beets in large pot of boiling salted water until tender, about 10 minutes. Using slotted spoon, transfer beets to medium bowl. Allow to cool. Once cooled, peel & slice into wedges. Set aside. Return water to boil. Add pasta to beet cooking liquid & cook until tender but still firm to bite, stirring occasionally. Drain, reserving 1 cup pasta cooking liquid. Return pasta to pot. 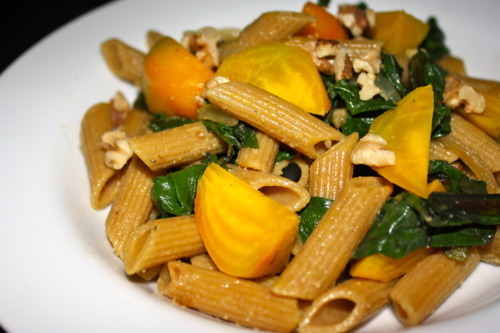 Stir onion-greens mixture and beets into pasta. Add pasta cooking liquid by ¼ cupfuls to moisten. Season with salt & coarsely ground black pepper. Stir vegan Parmesan cheese. Divide pasta among shallow bowls. Sprinkle with walnuts. Serve! This pasta dish turned out really nicely! I loved the salty bite of the vegan Parm with the sweetness of the beets & caramelized onions. The tender greens gave a nice balance to the hearty pasta. I think next time I might add some lemon juice & zest to the steamed greens for an extra bit of bright summery flavor. Enjoy!